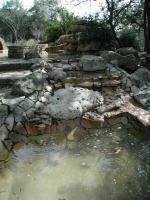 This interesting water fountain sits at the hike trailhead. Getting there: From west of Austin on Ranch Road 620, head south into the town of Lakeway. Turn right onto Lakeway Boulevard and head west for approximately one mile. Turn right onto Lohman's Crossing Road. Look for the parking area on the right about a quarter mile from the Lohman's Crossing turn. The Hike: The Hamilton Greenbelt is a surprising hike that provides a wide variety of terrain that is bound to please just about anyone. Depending on how far you venture from the trailhead you'll encounter flat gravel, hilly hard pack or mildly steep rocky sections. 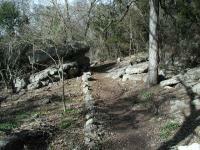 The terrain at the start of the trail is easy enough for hikers of all abilities. 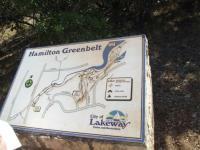 The land that comprises the Hamilton Greenbelt was generously donated by former Lakeway residents Jack and Myrtle Hamilton. In addition they also provided funds for its perpetual care. There is a plaque commemorating their donation at the trailhead. The trailhead also functions as a nice small sitting park complete with benches and a sculpture waterfall. 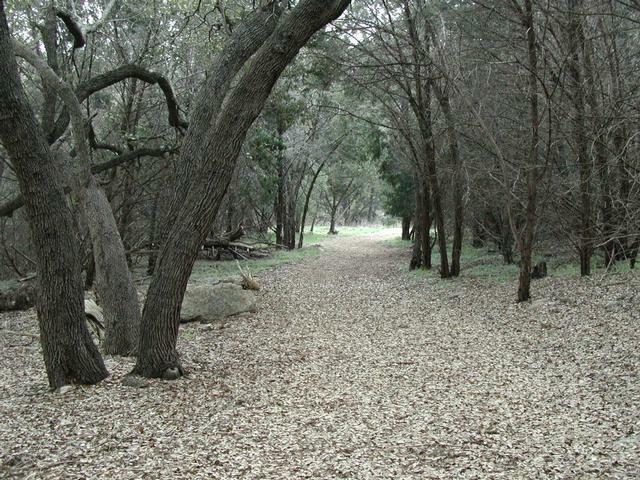 The trail starts off with a flat, gravel surfaced section that passes under stately oaks and various other species of tree. Some of the trees have identification markers on boulders nearby, but many of the markers appear to have gone missing over the years. 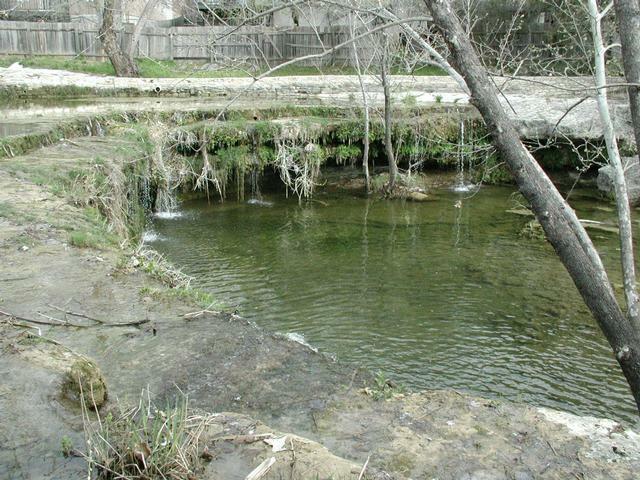 This greenbelt features an interesting circular waterfall at the waypoint "Waterfall". Here you'll find plenty of ferns clinging to slick rock overhangs. This waterfall is so interesting, in fact, that it's a shame that it was not made the centerpiece of a park. Instead, the backyards of houses line the opposite bank of the creek. 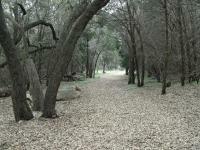 Many majestic oaks line the trail. After the waterfall the trail becomes ever so slightly more difficult. 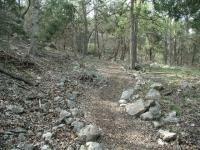 Parts of the trail are covered in mulch and the trail begins to rise above Hurst Creek. The real change in terrain however happens at the waypoint "Primitive Trail", which is actually the name of the section given by the trail maintainers. Though not technically challenging, the trail takes on a much rougher nature than the more park-like trail that lead up to this point. 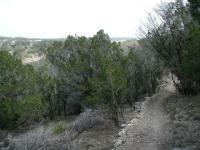 The primitive trail climbs up the slope of a ridge and splits into two at the waypoint "T-Left". By going left you'll be rewarded with some of the roughest portions of the hike and great views of Hurst Creek as it empties into the lake. The right fork leads to the alternate trailhead that we'll encounter later. 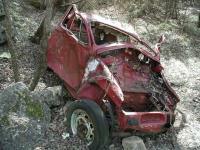 The farther one gets from the trailhead the rougher the hiking gets. 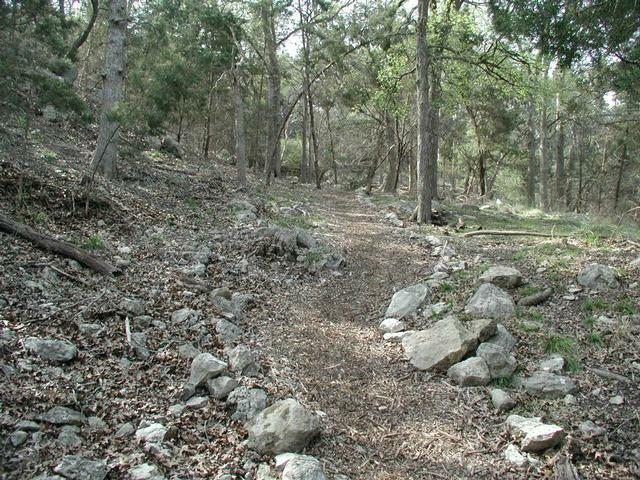 After hugging the slope for some distance, the trail descends to water level and slices through a meadow of Cedar Elm trees at the waypoint "Hurst Hollow". 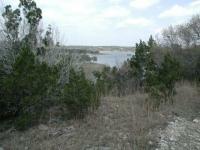 Beyond the waypoint, near the turnback point, there is a large stone picnic table with great views of the Hurst Creek arm of Lake Travis. On the back loop the trail ascends the slope over the lake once more before descending again back down to Hurst Hollow. On the return path you have an option of either retracing your steps back to the trailhead or exploring the trails to the alternate trailhead mentioned previously. 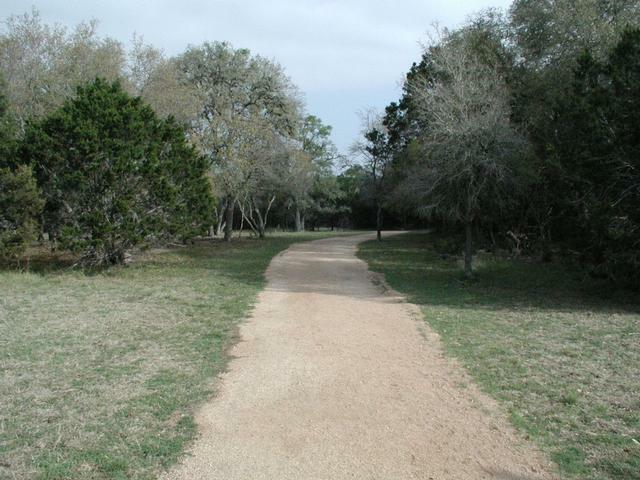 To visit the alternate trailhead, veer to the left on the parallel path at the "CrossOver" waypoint. In all, we logged approximately three miles. 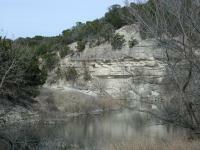 This entertaining hike provided a wide variety of terrain and sights right in the middle of a fast growing area of the Hillcountry and is highly recommended. We walked this as part of a 10K volksmarching event. Turned out to be a great hike! Little doubling back (you can head back to the main trail from the alternate path w/o doubling back). Short side trail named Smith Greenbelt that will take you 10 minutes round trip that is worth checking out too (it is on your left just after you enter the main trail by the small garden). Worth the drive to Lakeway for. Crushed granite trail runs along a creek & cliff - very nice. 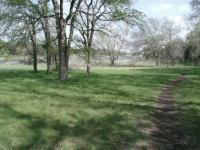 Lots of trees & great sitting areas, but you can see big beautiful houses at parts of the trail. There is also some white sprinkler piping running along much of the trail which takes away from the natural beauty. There are a couple water fountains along the way. Part of the trail, I veared to the right & hiked along a little more rugged trail - it was absolutely beautiful, but it dead-ended & I had to take the regular trail most of the way. 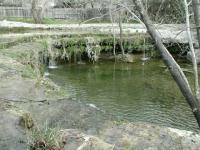 Revisited the greenbelt to find three geocaches that are hidden along the trail. Found a new side trail that I didn't know about before, which I'll add to the hike topo map shortly.